As this year began, my husband and I were living happily in an “eco-community” on the Rivanna River in Charlottesville, Virginia. Had you told us then we’d be living on Willow Oak Farm, with three horses, we might have given you a blank look. In town we had close neighbors, strolled to nearby restaurants or along the paved path winding by the river. It was a pleasant urban life; but without horses our daily chores were minimal. We’ve since learned what it’s like to wake early or work past dark for pasture-picking, or manure spreading, or checking to be sure the water in the stock tank is not frozen, or repairing fences and gates, or picking horse’s hoofs. It’s work—and we wouldn’t change a thing about this new life (well, a bigger tractor might help)! We now open the front door to gaze across a lush pasture at the sun setting behind the majestic Willow Oak at our farm’s entrance. The back porch receives sunrises over the run-in sheds and horses being themselves in the back paddocks. Near the barn we have a round pen where we work with humans and equines in support of journeys to wholeness. Finding and purchasing Willow Oak was a guided miracle that tells us this is the life meant for us. But that’s another story. 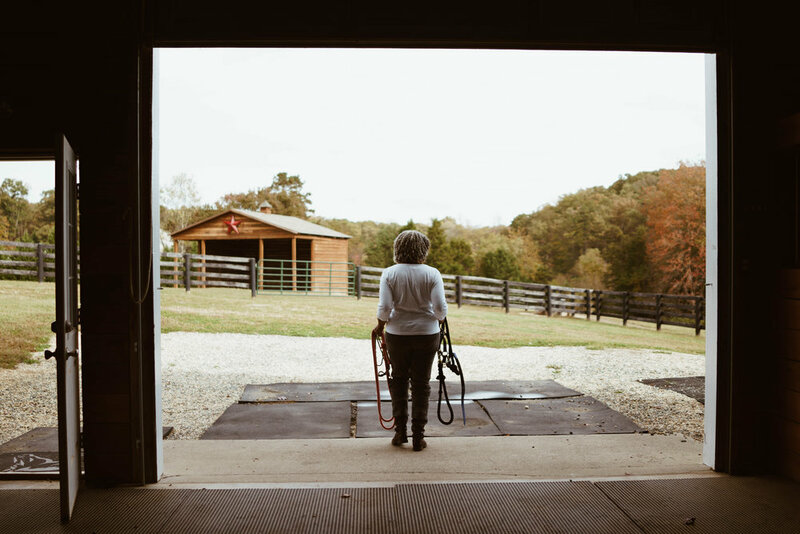 On a visit to the Virginia Equine Welfare Society (VEWS), a horse rescue facility in Ashland, Virginia, I used my Equine Empath abilities to help a traumatized horse. While in dialogue with another resident horse, I felt a mare named Raven come up right behind me, her head at my shoulder and the side of her body against my back. “I’m the horse you’ve been waiting for,” I heard Raven say. "Take me with you and I will help you to deepen your work,” she continued. Two months later I returned to VEWS with a friend and her trailer. We were there so I could adopt Raven and bring her back with me. Raven was the horse I’d dreamed of having, way back when I was a girl of 12 years old. My husband and I were living in a house in the city, so I had to put Raven in a boarding facility, a distance of 45 minutes away by car. But over time, I longed to see her every day. So we sold our home in town and bought Willow Oak Farm. Now we all live together in the same place. Ruby is the "traumatized, struggling" horse I originally went at the VEWS. After learning from VEWS folks that Ruby's condition had since improved, we adopted Ruby to be Raven’s pasture mate. Ruby has shifted from a frightened, sometimes snippy and aggressive mare, to a gentle, sweet, happy companion for us all. Life at Willow Oak was going well for Ruby and Raven. But husband Bill thought we needed “more masculine energy” on the farm. I agree. We found Nash, a 16 hand quarter-horse appendix, living on the south side of the James River on the historic Belmead, a former plantation now horse boarding facility. It didn’t take long at all for Nash to establish himself as leader in our small herd. And within a day of his arrival, Raven, feeling relieved and safe with Nash nearby, laid herself down on the ground to rest. She had never done that before!